After signing day I heard a lot of squawking about this recruiting class and couldn’t help but shake my head. For years Oregon fans have bemoaned the lack of elite line talent on our teams. This showed especially during bowl games against physical opponents from the Big 10 or SEC (I can still see OSU running counter trey over and over in the National Championship Game). That is precisely why I cannot understand the incessant whining about this recruiting class. As most of you can remember, teams like Stanford and Bama have been our kryptonite. Teams that could control the ball, run clock and convert on third-and-short (see Stanford 2012-2013 and OSU in the NCG). With teams catching up to the spread, we can no longer rely on wearing teams down. It is now more critical than ever to win the game in the trenches. One of the great pieces of revisionist history was that Chip Kelly and Mark Helfrich excelled at making halftime adjustments, and that was the reason for outscoring opponents so dramatically in the second half. That, my friends, is a misconception. Advanced stats during the Kelly/Helfrich era show Oregon’s first two possessions in the second halves of those games did not have a significantly greater likelihood to result in scoring. 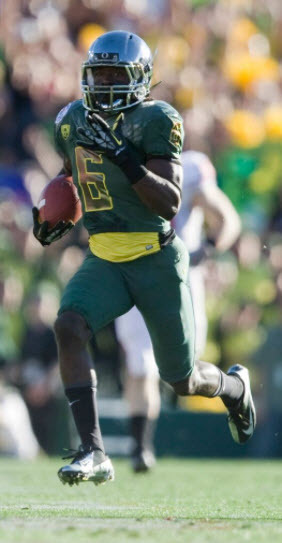 De’Anthony Thomas runs for another explosive play at the Rose Bowl. When did that likelihood skyrocket? If you guessed 4th quarter, you’d be correct. That was due to teams not being able to keep pace with an up-tempo team. Notice the marked drop off in 4th-quarter scoring during Helfrich’s last two years? Teams have adjusted to the spread, and opposing defenses have adjusted to up-tempo. This #mOvement (the current recruiting class) is what gets the contrarian in me fired up. While the rest of the conference is laser focused on spread, hurry-up football, we are investing more than ever in recruiting and developing elite offensive and defensive linemen. We are “zigging” when everyone else is “zagging.” Let me be clear, this doesn’t mean we’re turning into Stanford. We will still run the spread: Coach Mario Cristobal ran the spread at his last gig, OC Marcus Arroyo learned the ropes from a spread guru at Oklahoma State and RB Coach Jim Mastro was a pioneer of the pistol! We are just going to be focused on owning the line of scrimmage on both sides of the ball. We now have two of the best line coaches in the country in Big Joe Salave’a and Coach Cristobal, and we just landed the best offensive line class in Oregon history! The last two classes of LBs have been very strong (I haven’t seen a better back-to-back classes at the position). When you look at what the last two recruiting years mean for our front seven, it’s clear we have built the foundation of an elite team! Our defensive line depth is the best it’s been in years, and our O-line will likely be the best in the conference. The reason I feel like this is more critical than ever is the addition of Chip and Kevin Sumlin to the conference. 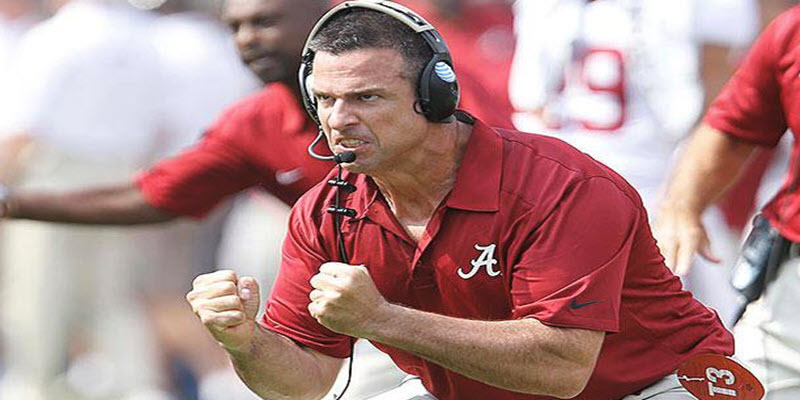 Cristobal is building exactly the type of team that Chip and Sumlin have proven to have difficulty with. Building the lines was important when Mike Leach joined the conference, and now it’s critical. The next piece that gets me fired up is the upgrade of talent across the board. Historically, no team has won a NCG with less than 40% of their roster composed of 4-star or greater talent. Up until last year, Oregon’s percentage had been trending downward each season, bottoming out at 28%. Interestingly, 23 out of 46 commits for the Ducks over the past two years have been rated 4 stars by at least one of the Recruiting outlets (ESPN, 247, Rivals and, formally, Scout). Last year, we had 11 including DJ Johnson (not including Bruce Judson and Rutger Reitmaier). This is exactly how elite teams are built—from the inside out. Yes, this class had the potential to be better from a ranking perspective, and we missed on three recruits that I was ticked about (Devon Williams, Eli’jah Winston and Miles Battle). But what this staff did in the face of coaching turnover and ruthless poaching by Taggart was nothing short of special. 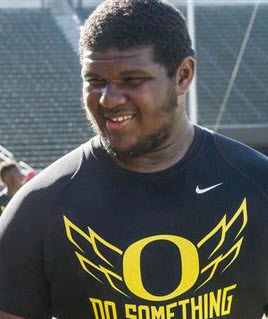 Justin Johnson is a big part of Oregon’s future at 6’7″ and 355 lbs. The third component this staff is focused on is talent development—to a degree that we have never seen before. This staff is focused on developing Functional Strength and Speed, with some of the greatest minds in the country at the helm. In the Chip years, the pendulum swung toward speed (I would argue track speed) to maximize talent and schematic advantage. By the end of his tenure, the pendulum swung too far to that end of the spectrum, in my opinion. While we saw the explosive offensive results, we also saw injuries pile up. We all bemoaned those season ending injuries that seemingly always destroyed a shot at the national title. I will argue vehemently that the 2015 National Championship Game would have been very different with a healthy Pharaoh Brown and Devon Allen (not to mention a healthy Ifo Ekpre-Olomu). This strength and conditioning staff has built exceptionally physical teams at ‘Bama, Georgia and Wisconsin and is going to leverage the speed coaching expertise of Coach Jim Radcliffe in coordination with developing Functional Strength. For example, Georgia did not have a single season-ending injury this year. Look it up. Not a SINGLE SEASON-ENDING INJURY IN THE SEC!!!! Wisconsin has consistently been a top 10 team despite running a cave man offense and recruiting results that are below the top echelon of the conference. Ask yourself, why? I cannot emphasize this enough. The glaring lack of expertise in strength coach Irele Oderinde was immediately evident (see three cases of Rhabdomyolysis). I have completed 13 Ironman triathlons and have never been diagnosed with “Rhabdo.” Three cases in one workout is pure incompetence. While Coach O successfully bulked this team up, he didn’t successfully turn that into useful size and strength. I could spend four separate articles on this subject alone, but I think you get the point. Oregon has lacked talent development the last four years, and while some of the bleeding was stopped last year, I’m here to tell you that those days are over. Looking purely at recruiting rankings of Pac-12 teams … you can see it clearly. Oregon is objectively one of the most talented teams in the conference when you average the last four recruiting classes. 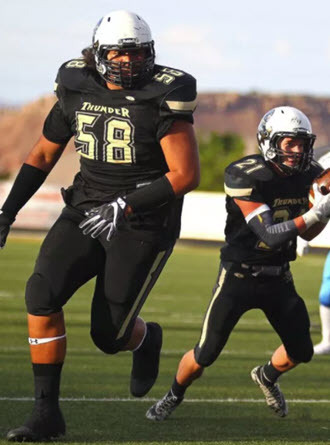 At 6’5″ and 349 lbs, Penei Sewell is big, fast and athletic as part of the new wave on Oregon’s offensive line. So if we are the third most talented team behind USC and UCLA, why are we getting manhandled by Stanford, UW, and WSU? Because we have had poor talent development and poor talent utilization. However, that tide started to turn last year and is now in complete reverse. Most Oregon fans forget that our defense started to slip when Coach Jerry Azzinaro left. We now have talent developers on both sides of the line of scrimmage. Improved talent development typically doesn’t show up dramatically in year one, but it does over multiple years (see Chris Peterson at UW). The reason for this is the theory of “marginal gains”: essentially, extreme attention to detail (see Chip Kelly years) combined with incremental daily improvement. When you add all of the days up, the impact of all of those little details becomes dramatic. Nick Saban‘s book goes to great length explaining this. For example, he literally has the exact same lunch every day. The reason behind that is that he calculated on average it took him five minutes to decide on lunch and that it took a half hour of staff time to pick it up and bring it back. He did the math and determined that by having the same thing for lunch every day, he freed up about 146 hours of time for himself and his staff annually. He then figured that if he took that time and dedicated it to recruiting, analysis and development, he would gain a 146 hour advantage on all of his competitors. We often hear of coaches burning the midnight oil but this is different; this is focus on the things that translate into results. This is the approach that is now being implemented at Oregon, at every position, from analysts to strength and conditioning. The little things add up. What does this all mean? I believe it bodes well for the long term. GO DUCKS! My friends, there will only be two articles published per week is all on Mondays and Wednesdays, (and occasionally on Friday) but I will still be writing. The quality for each will be very high, but fewer is all. Click below in the announcements for why this is occurring.